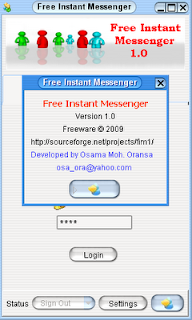 They are build over Java Remote Method Invocation (RMI) technology, there are a lot of features in this server , including 3 different security level , file transfer , announcements , nice emoticons and easy customizable project. 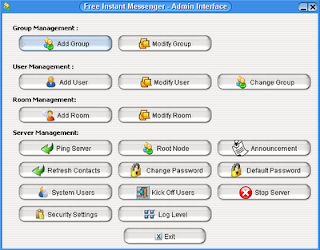 The installation of this chat server toke less than 2 minutes ! --> change it to express your company or organization name. 2.Run Start Server .exe file or batch file (windows .bat) or .jar file by : java -jar command in UNIX (same as in the batch file). --> Admin email account and the server IP and port. 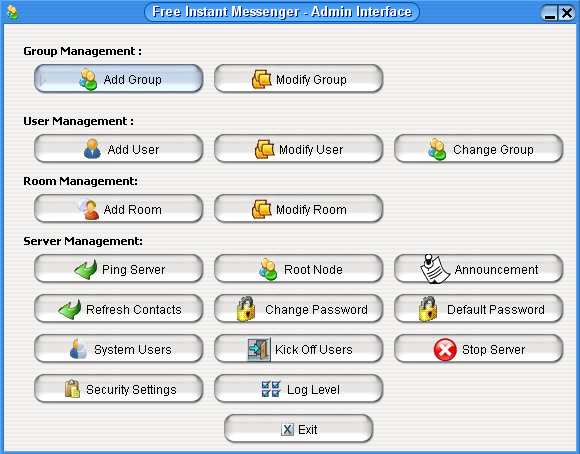 Once you logged in change the adminadmin interface to any password. 5.Default password for any created user is user, you can change it easily by admin interface, set default password. -->Update email domain to your organization/company domain. -->Update server IP and Port. 7.You can run now the client , default password is "user" , unless you changed it by default password option in the admin interface, ask the system users to change the passwords once log into the system. This is how the admin interface looks like. Enjoy it..... or participate in developing it and integrate it with the standard protocol like XMPP. You can also customize it , enhance it and release a new variant of it. You can generate Java Docs from the source code in the SVN. Hi Osama - where can I find the logs and how do I read them? In the console of both apps try to start them using command line not as .exe apps. I wish to see records regarding users chat. I need to trace all messages. Running the apps using cmd didn't give me any log options. 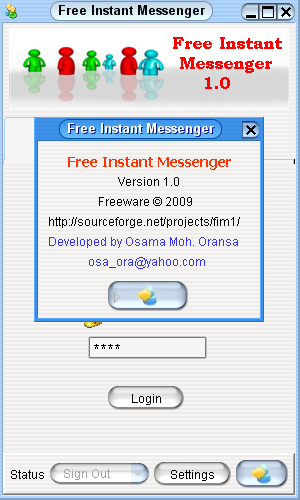 You shouldn't log user messages :) otherwise it is not a chat app ! I have followed the directions completely up until step #4. I cannot login to the Admin interface (FIMAdmin.exe). I am getting the error "incorrect user email or password". I used the email that I changed it to in the admin config folder and the password is adminadmin . I even changed the email a second time and I am getting the same error. I am really excited to use this program, so I would appreciate any help in this matter. Thank you. Try to re-extract it again and use the default admin email/password and let me know what will happen.